Barberry and other so-called berberine plants (members of the Berberis family) have been used for centuries to treat skin problems, remove toxins from the blood and as a remedy for dyspepsia and ‘functional derangement of the liver’. Today barberry is still regarded as an excellent anti-inflammatory and liver tonic, and scientific research is showing that it has other health benefits too. The fruits, bark or root of Berberis species are used for medicinal purposes. The active ingredient in members of the Berberis family is berberine, a bitter antimicrobial chemical that fights certain bacteria, fungal infections, protozoa and viruses. Scientific research has proven that berberine may reduce inflammation and inhibit the growth of abnormal cells. Studies suggest that it also helps fight the effects of cholera, E. coli and Pseudomonas aeruginosa infections; reduces inflammation; encourages the secretion of bile; and inhibits an upset digestive tract. According to Jacob Schor, a director of the Oncology Association of Naturopathic Physicians, berberine has ‘the same benefits as exercise, dieting and weight loss – the lifestyle modifications considered beneficial for a range of maladies’. Fight inflammation of the gall bladder, gallstones and jaundice. Act as a digestive tonic. Treat kidney and urinary tract infections. Treat metabolic syndrome (a combination of conditions that increase the risk of developing cardiac disease and diabetes). Reduce increased levels of glucose in the blood. Reduce levels of “bad” cholesterol in the blood. May help in the treatment of cancer. 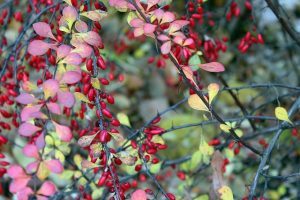 When taken in the correct dosage, berberis appears to be quite safe. Do not take it if you are pregnant, however, as berberine may trigger contractions. As is the case when embarking on a course of natural remedies, it is best to consult your healthcare professional beforehand. Barberries are a common ingredient in Turkish and Middle Eastern cuisine, where they are usually added to chicken or rice dishes. The berries are also used to make preserves and jams. In South Africa, they can be purchased online or at stores that stock Middle Eastern foods. Indigenous to Europe and Asia, Berberis species are attractive thorn-bearing shrubs with leathery leaves, small yellow flowers and edible red berries. Berberis vulgaris appears not to be grown in South Africa, but other species in the same family, such as Berberis thunbergii, are well-known garden shrubs. Grow the latter in well-drained soil in full sunlight, water regularly and prune the old growth each winter to encourage new growth. The plant’s leaves are deep bronze, turning to a rich crimson-red in autumn. In colder areas, pale yellow flowers are borne in midsummer.